The Upper Lot, adjacent to Springfield USA and near the Special Effects Show. Universal Express and VIP seating are offered. Download the official Universal Studios Hollywood mobile app or visit USHWaitTimes.com for showtimes. Keep in mind any animal allergies – you’ll be in close proximity to dogs, cats, birds, pigs and more! Meet actual screen-working animal stars in an educational, humorous look at animal training, acting, and stunt work. Appropriate for all ages. Those with a fear of birds should be aware that large birds fly into and over the audience at several points throughout the show. Despite its location in a perpetually slammed corridor of the park and relatively small auditorium size, it isn’t difficult to get a seat. If you want to sit toward the front end of the theater, show up at least twenty-five minutes before showtime. If you’re content sitting anywhere, it’s often possible to walk in just as a show is starting. To be safe, we recommend ten to fifteen minutes before showtime except on the busiest of days. As with most Universal Studios Hollywood shows, the first and last show of the day usually have the lowest crowd levels. The attraction’s trainers and hosts will request at least two children volunteer (usually one girl, one boy) and one adult volunteer. The kids get to get up on stage with the show’s performing dogs, while the adult will interact with a dollar-snatching bird. At the end of the show, stick around – often the trainers will bring out a few of the performing animals for a quick meet and greet. Be aware that since the show deals with animals, their comfort and safety comes first. 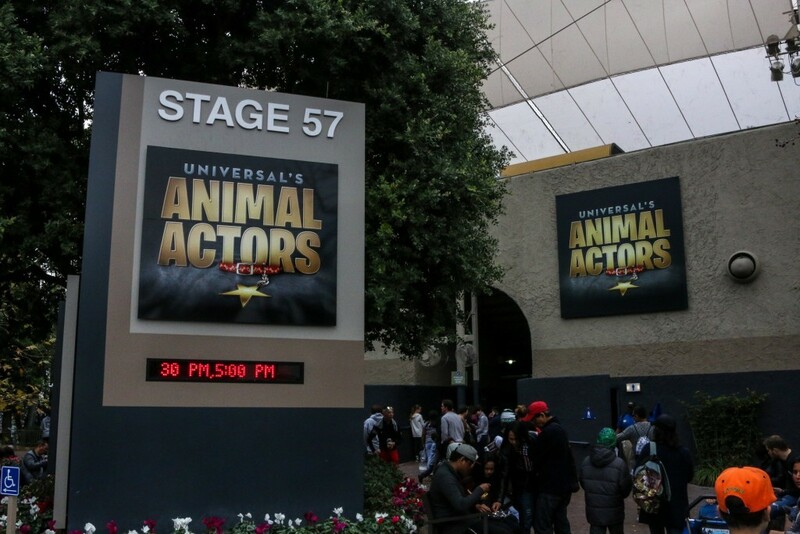 Animal Actors has a large fleet of furry talent, but it has been known to shorten or cancel shows if the performers don’t cooperate. Also keep in mind that Animal Actors will cancel shows due to inclement weather.